You might be one of those crazy-talented folks who knows exactly how you want your home to look and how to tie it all together. Or you may have only the vaguest idea that something in a room just feels off. Regardless of your design skills, when find yourself in a home-goods resale or consignment shop and you spot a piece that you love—whether it’s a huge piece of furniture to anchor your entire room or a perfectly proportioned accessory—there is probably a physical reaction. Your heart beats a little faster, you might even get a little light-headed. And then you check the price. The elation when the numbers on the tag are actually below what you were hoping to spend sends another spike of adrenaline, and you can’t help it—you are hooked. 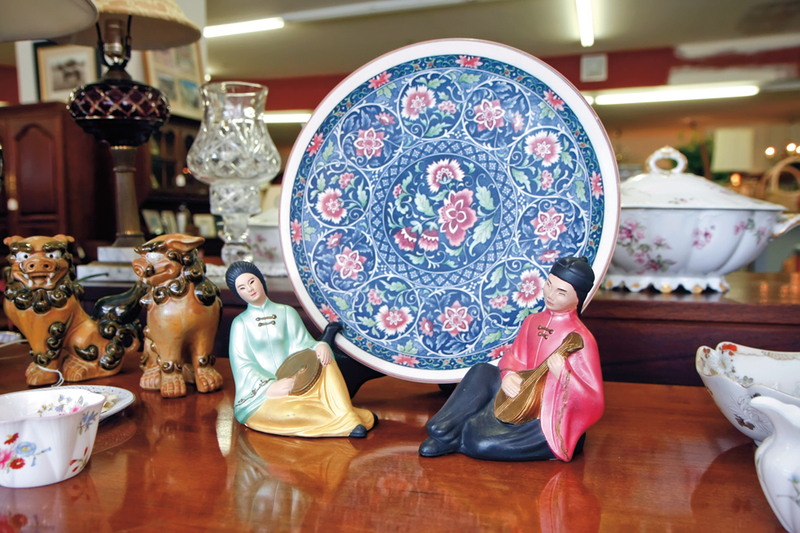 More and more often, discerning shoppers and designers are scouring local resale, consignment and estate-sale home-goods stores to find those types of deals. Such stores are enjoying a renaissance—as an affordable (and environmentally friendly!) option for homeowners looking for unique pieces that fit their specific needs and their style. With fall on the way and the prospect of more and more time spent indoors (not to mention the upcoming holidays), the nesting urges will kick in. It’s about time to start making a list of things you might like to update your home—whether you’re making it more comfortable, more functional, or simply more of a reflection of your current tastes. You may need to address a problem spot—needing more storage near the kitchen door, for example—or feeling like it’s time to replace the sofa you never thought was as cushy as you’d like it to be. Maybe it’s something as simple as adding a new centerpiece in your dining room, or adding a few seasonal pillows in your family room to zhush things up. If any of these home-dilemmas sound familiar, then get yourself set for an adventure, and plan to visit these locally-owned, ever-changing stores that specialize in reselling quality items for your home. Both the beauty and the beast of second-hand shops is that their inventory may never be the same twice. Because it’s so different than flipping through furniture catalogs or walking the aisles to find something to order, owners of such stores suggest two things: keep an open mind, and be prepared to purchase. 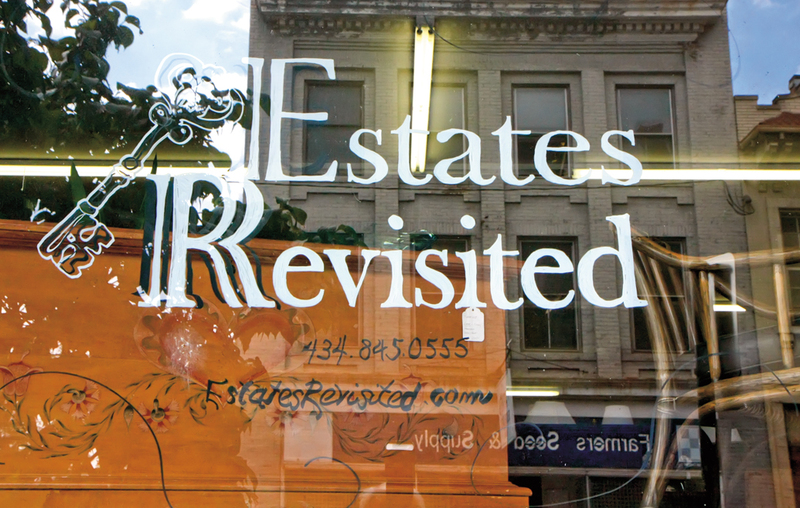 Joanne Newcomb, who owns Estates Revisited in Lynchburg and a new branch in Forest with business partner Art Dodd, says their stores change every single day. “We purchase items from people in every phase of life,” says Newcomb, from couples who are downsizing to families who are moving across the country. The styles are as varied as the people who originally bought them. 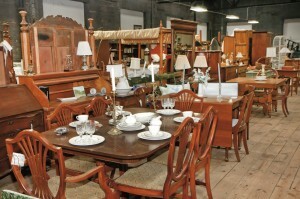 Shoppers, too, are unique and varied, including everyone from those looking to furnish their first apartment to seniors who are opting away from their antique dining room table for 12 to a more practical six-top. Some have an eye for fixer-upper pieces, while others prefer the “purchase it to place it” method. There is no one way to shop, and these stores have such a vast array of furniture and accessories that it can be intimidating for the uninitiated. “You can’t really explain it to people who haven’t done it,” says Newcomb. While different people employ varying techniques when shopping—some come in with a mission, some walk the aisles and make three or four passes, others plant themselves and do quadrant looking—there aren’t really any tricks. “My advice is always: ‘If you love it, get it.’ If you love something, whether it’s monogrammed flatware, a rug, or an entire dining room, it will go together in your home with what you already have because it’s all a reflection of you,” says Newcomb. For shoppers who are looking for a very specific item or for a specific space, it’s best to have your exact dimensions handy. No matter how much you are drawn to a particular piece, if it won’t fit in the space you have available, it’s better to pass, unless you love it so much you’re willing to change other spaces in your home. Some stores have pieces grouped according to size or style; others set up mini-rooms, complete with rugs, drapes and accessories. 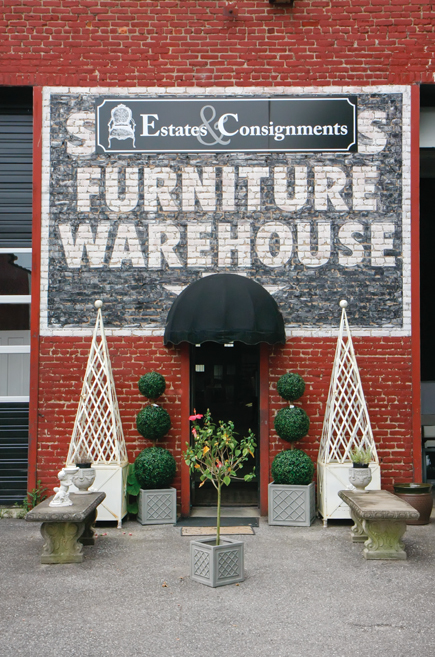 Moyanne Harding, who owns Estates and Consignments at Twelfth and Commerce Streets, says that without a doubt the biggest draw to shopping in resale shops is the bang for the buck. 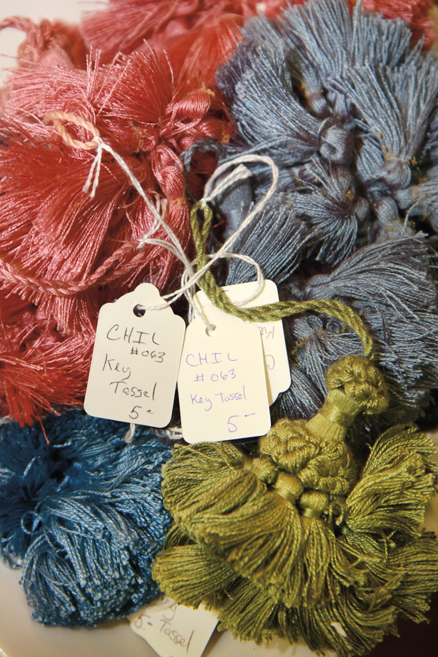 “Pieces are a lot less expensive, often they are better made, and there are more one-of-a-kind items that give buyers something unique, something special,” she says. but the color wouldn’t go well in your family room? Slipcover it or reupholster. In a move to assist customers in their design endeavors, Harding recently consolidated her two businesses (Interiors by Moyanne, and Estates and Consignments) under one roof. While Harding offers differing levels of design services—everything from turnkey design-and-build to consultations—she says she’s seeing more homeowners who really want to decorate their spaces themselves, but need a little help. 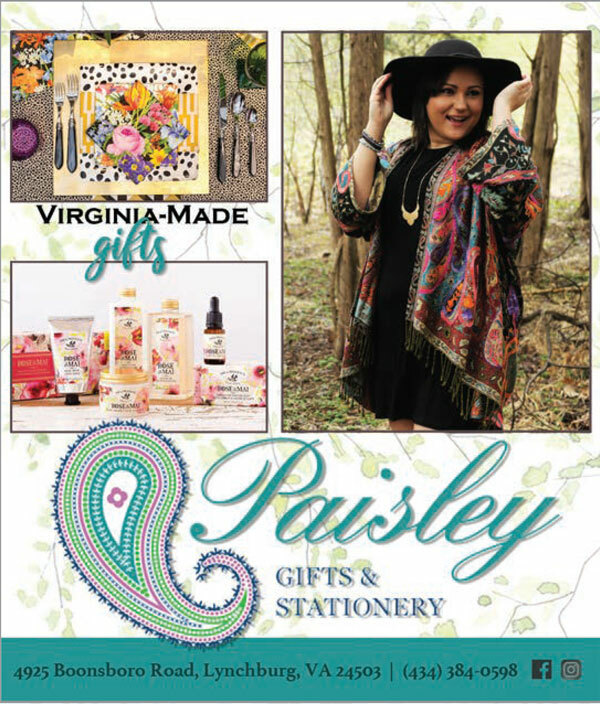 Her shop fits that niche, she says, because the design center is staffed with employees who can help shoppers find great pieces at reasonable prices, and also help them with the details of refurbishing or repurposing to ensure their purchases fit well into their existing décor. She’s also seeing more eclectic decorating, with homeowners being more adventurous in mixing furniture styles, finishes and colors, along with blending accessories—much less matchy-matchy than in previous years. “I feel like it’s best to just shop for things you love,” says Harding, explaining that many homeowners naturally tend to follow a color or pattern theme, adding to the current, eclectic trend in design. Because estate shops purchase everything in a house, they offer so much more than furniture. 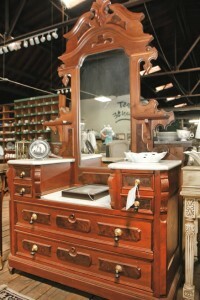 There are tools, kitchen appliances and dishes, light fixtures, accessories, linens and artwork. “We have way more artwork than we can hang,” says Newcomb. “So we price things to move; typically we’re pricing for the frames.” She’s had customers buy multiple frames, then paint them all in one color to be a cohesive display for artwork. Others have used empty frames to decorate a mantel. Decorating choices are limited only by imagination. Bonnie Hagar, who owns Next Time Consignment with her husband, says for those who are less inclined to change entire rooms, consignment shopping is a perfect way to add some umph. Think lamps or even just new shades, curios, a new-to-you end or side table. The store also offers chalk-mineral paint, for those who see a project piece. 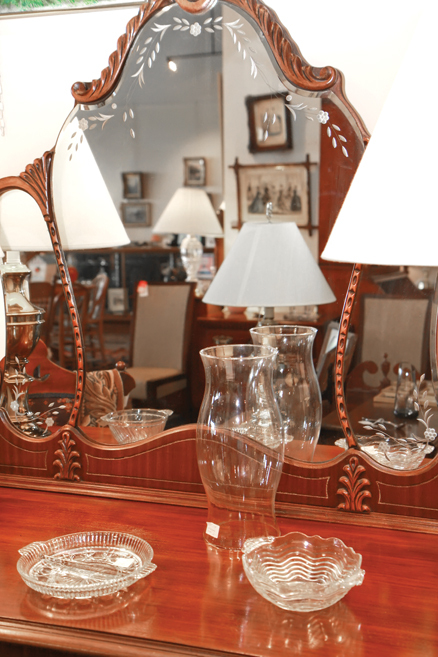 While Newcomb’s stores buy estates and partial estates outright, Harding’s is a mix of estate sales and items that have been consigned by their owners. In a traditional consignment store, like Next Time Consignment, items are brought to the shop by their owners, and there is an agreement between the owners and the shop as to how the piece or pieces will be priced. At some consignment shops, the longer the item stays in the store, the less expensive it will become. When goods are purchased, the money is split according to the contract between the store and the owner. While you might pay less the longer you wait, you may risk losing out to another buyer. Hagar says her store “accepts quality furniture and housewares seven days a week, so you never know what you might find when you visit.” Items have come in and gone out in the same hour. If you haven’t ever consigned an item or been a consignment shopper, she says it might be surprising; while some have a perception that buying “used” is less desirable, she suggests shoppers look at the value. Her Waterlick Road shop, which has been open a little over two years, recently offered a side chair for a fraction of the $2,000 the original owner paid for it. But, she says, the key to being successful in finding those crazy-amazing deals is to check in often. Understanding that this might not always be easy, Next Time posts photos on Facebook several times a week of items that come into the store. Employees also are quick to respond to online questions about dimensions and prices. “We don’t want anyone to miss something they would love,” says Hagar, who says the store has even added a wish list, so if searching for a particular piece or manufacturer, the store can notify you. “We work real hard to have a positive relationship with our customers, and we also work really hard to accommodate all reasonable requests,” says Hagar. So don’t be afraid to shop without knowing exactly what you might be looking for. 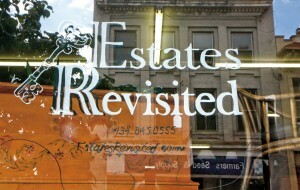 These reselling shops are interested in generating happy customers. 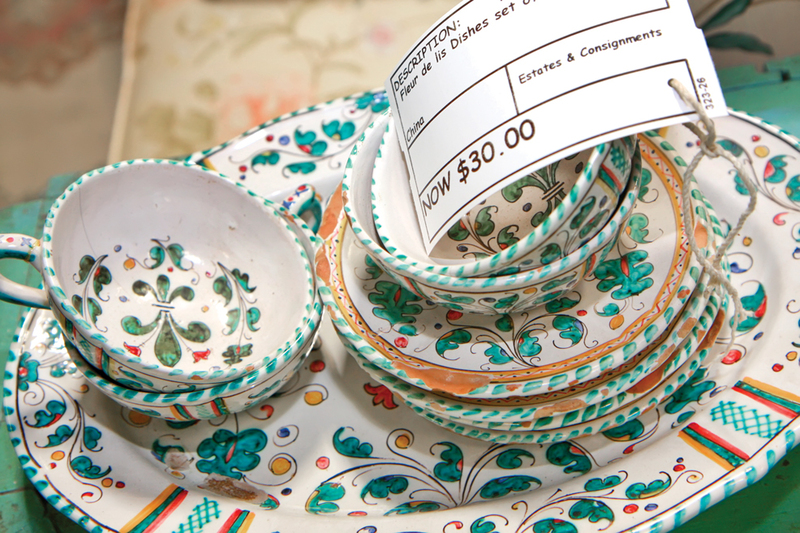 If you’re up for waiting until you find a piece—unique, well-made items at a reasonable price—that hits you just the right way, browsing these shops might just be the perfect way to fill up a day or two. Just don’t forget your vision, or your wallet. Both the beauty and the beast of second-hand shops is that their inventory may never be the same twice. Treasure seekers will enjoy the thrill of the hunt for home furnishings, accessories and collectibles in an ever-changing stock of items. My advice is always: “If you love it, get it.” If you love something, whether it’s monogrammed flatware, a rug, or an entire dining room, it will go together in your home with what you already have because it’s all a reflection of you.